Where's our money? Greens accuse billionaire Richard Branson of not fulfilling pledges | Watts Up With That? Eric Worrall writes: Flamboyant British Billionaire Richard Branson, the man behind Virgin Galactic, the commercial space tourism venture, has been accused by greens of not fulfilling $3 billion of his green funding pledges. “Richard Branson has failed to deliver on his much-vaunted pledge to spend $3bn (£1.8bn) over a decade to develop a low carbon fuel. I guess even green billionaires have to make a choice, eventually, between pursuing green investments, and being a billionaire. To be fair to Branson, he tried – the £300 million he spent and presumably lost is a significant sum. Branson’s experience demonstrates that at the end of the day, only governments have the luxury of being able to sink vast sums into green money pits, without any serious possibility of a return on investment. September 14, 2014 in Climate cash. Good for R.B. this is why the govt needs out of the green business so all that nonviable crap can wither and die a natural death. Or if the market wants it and is willing to support it, fine. Other than that uncle sugar can stop stealing from the taxpayer. So their issue with Branson is that he hasn’t put enough feed in the trough. I bet though what he’s done to date has been tax deductible. Mmm. If it is money lost by investment, then it is deductible (and should be). I could not disagree with you more. Anyone can make irresponsible or criminal choices spending other people’s money with no risk of losses. Covering the losses of fools is completely unacceptable, it rewards failure and encourages a spiral into systemic failure, corruption and criminality. When you risk your own money you do actually try to plan and build real investments which so pay you back, and a whole lot more, and which are then generating a proportion of taxable income. People who want the rewards must always shoulder the risk and remain accountable for their losses. Expecting others to pay for foolish gambling habits is naked public fleecing and theft by a corrupt actor who should be bankrupted then asset stripped to their underwear. That’s how you keep the riff-raff’s hands out of the public cookie jar so you can create and maintain a viable civilization. What you suggest, namely, that tax payers “should” always pay for others gambling losses, is about as wrong-headed as you could possibly be and approximates the mindset of a criminal who’s accustomed to getting away with feeling completely entitled to steal other people’s money. But maybe it’s a winning formula for ‘investment’ success if you’re the Mafia, or else you’re a banker … but I repeat myself. Anyone can make irresponsible or criminal choices spending other people’s money with no risk of losses. Not him. He just lost it. Therefore is is universal practice that he be permitted to deduct it. This is not a Solyndra-type example where he takes no loss. So you believe that if someone makes a poor investment and loses his money that other taxpayers be liable to fund his loses. That’s crap. If he loses it, he should pay all of it. You are losing track of the fact that the only way he can write off these losses is to have other income to write it off against. This is long established, and economically sound, tax policy. In general, we do not tax people on gross income, we tax them on net income – however foolish the source of their investment losses appear. So how do you feel about people on welfare, food stamps, unemployment insurance, etc.? You don’t think that in a lot of those cases bad or criminal choices got them into the position they are in? In those cases, is “covering the losses of fools completely unacceptable?” You are describing the concept of “moral hazard” and it is a big challenge for society. We have too much of it today, and that’s largely why just about every country on earth is buried under debt. Unmentionable: if drug companies and innovative companies were not able to write off their losses against the profits of their successful products, there would be no more new medications or innovations, particularly with the high corporate tax rates of the US. Unmentionable, I think you are mistaking a tax write off for a bailout. Nobody is covering his loses, they are simply saying the amount of taxable income he has is less. Sometimes I read a comment on this site and just shake my head in disbelief. Yours has been one of them. Richard has enough losses to set against tax without needing to lose $300 million trying to make diesel from palm oil, clearly you haven’t noticed that Virgin Atlantic lost £200 million over the last two years and having to pay the excessive cost of using green fuel would just have made that loss even worse. Unlike his Virgin airplanes, Richard Branson will only be seen to go with whatever direction the wind is blowing ……. The ‘green’ activists don’t give a damn if businesses go bankrupt trying to finance their pipe dreams. Branson, fortunately, is a a pragmatic businessman first and a mush mouthed ‘environmentalist’ second. Perhaps the Greens failed to notice that “investment” implies future positive returns. I imagine that Branson’s commit and the money that he did spend got him access to some very powerful people that he might not otherwise have had access to, and during their conversations is strikes me as plausible that other subjects of interest to Branson’s corporate entities may have come up…. I expect that Branson considers the 300 mil as being better spent than he may publicly admit. Branson is the person everyone else wants access to! Especially in the UK all doors open for him. He doesn’t spend money to impress anyone. As long a $200M went to Obama and the democrat party or else Holder will have to investigate RB. He probably reckons that the three hundred he has spent is the price of experience, and he is not going to throw any more down the drain. There is no such thing as a low carbon fuel that is economically and financially sound. If he has got wisdom, and has met interesting and/or useful people, that is all to the good. As of mid-August, Tom Steyer had only raised $7mil of the $50mil he had pledged to match, for a potential $100mil to “green” candidates in this election cycle. Looks like Steyer’s performance will come up laughingly short. All that stuff is based on the premise that the technology actually works. Then they go in bigtime. But not only has the investment seriously underperformed, but there is no easy fix on the horizon to turn the equation around. The investori must be more than a little miffed at those who presented the prospecti. But if their ain’t no gold in them thar hills, they catch on pretty quick. If they could somehow come up with a tremendous leap in battery tech, then they would have a shot. I am led to believe that the first motor vehicle death ever recorded in the USA involved an electric car. What is your problem? Get with the program! Sometimes they got stuck on “on”. Anthony, small correction, you stated English Pounds (£) for the 2.7 unfunded amount, when it’s good ole American $$$. A small currency conversion. The article states he pledged $3 Billion, which works out to be £1.8b. I’m not being nit picky, but I’ve seen people go ballistic (mostly elsewhere) over simple grammatical errors, etc.. I don’t want your “competitors” to have any ammunition to try and discredit you. Some people will latch onto anything and make accusations on the accuracy or your postings.. Just some feedback. MikeH, good spot – thanks for the correction. I’ll have to work on my reading comprehension skills. I just knew that green was only about the money! I don’t object to doing well by doing good. The naivety of someone expecting Branson to fulfil his pledges is touching. His method of working is to let someone else run a service and bear the risk while he allows them to use the “Virgin” brand and concentrates on being the loveable businessman with a beard who doesn’t care about money (but somehow seems to have lots of it in his personal account. He got good publicity from making the promises but he was never going to go any further than that. I would have thought that green activists knew all about hollow promises, they use them all the time themselves. “Richard Branson is one of the world’s most intriguing, successful and enduring billionaires. Worth $4.2 billion as of FORBES’ last count in March, Branson is, of course, the founder of the Virgin Group, which consists of more than 400 companies worldwide, almost all of which bearing the word ‘virgin’ in its names. try to register the Virgin Olive Oil Shop and you will hear from his lawyers. The man is ruthless. BTW, he also manages to hide the finances of his empire which is why you have such widely differing estimates. Of course it was all a lie. But a few million to the right people will bury that fact faster than modern science. Branson was stupid to promise that he would invest so much. He should have figured out that the economics of green investments don’t justify much investment, BEFORE he made the promise. It seems as if he’s figured it out now. I think he owes no apologies. He made his promise (and lost his money) based on information received that was hopelessly incorrect. If anything, he is the one who is owed an apology. Richard Branson is a money driven & totally ruthless businessman who tried & failed to suppress the Tom Bower biography of him. He’s a wolf in green sheepskin. The public images of both Branson & the Greenies, sold to us by the corporate lamestream media, is so far from reality that those media are now beyond a joke. Have to laugh that this article appears in The Guardian – a paper so focused on being successful and profitable that even its own CEO thought last year that it will not survive! Reality is perhaps dawning on CEO’s of businesses and they realise that as governments wind back their support for the Alarmists (the UK Government calling them the “Green Taliban” is pretty indicative of a shift in opinion) – then why should they throw good money at people who refuse to see reality? It has long been said that if the Financial Services Industry used data to predict fund performance the deeply flawed way that climate models abuse the underlying actual performance/temp data then those individuals would end up in jail – and quite rightly so. 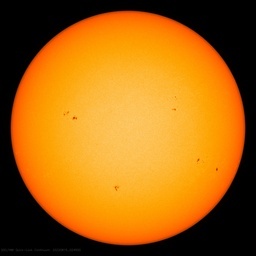 Perhaps the likes of Branson et al are getting hard info from advisers as to the accuracy of the Alarmists position. Productive effort that the world never gets back. Perhaps Mr Branson could consider investing in nuclear power. I am sure Kirk Sorenson could do with some of that promised funding to move along the development of the Liquid Fluoride Thorium Reactor, the only sensible long term solution to providing significant amounts of electricity without using fossil fuel or wasting large areas of land with next to useless windmills or part time solar farms. You often hear of Greens whining that sceptics are in the pay of Big Oil, is Branson now the equivalent of the so called Koch brothers. OTOH, I never objected to the “bros.” in the first place. Richard didn’t get to where he is today wasting cash, he’s seen through the scam so the money tap is off. Good on him. This pretty well covers it. Branson is not going to chuck good cash into a money pit when he can see no return. When he pledged the cash he clearly saw a PR win and the possibility that he was buying into a money making venture. The whole biofuel/corn ethanol thing has since gone a bit toxic. There is still plenty of PR mileage in looking green though so don’t expect a U-turn any time soon. Naomi is probably doing the green coffers no favours by alienating him but her red pulp has burst out of her green skin. Branson’s buddy Burt Rutan got to him, I imagine. Had a talk. And by the way, Burt Rutan has a massive grassroots enthusiast audience each year at the annual Experimental Aircraft Show in Oshkosh, Wisconsin, where he is quite outspoken, that 100K American garage builders of private planes gather after they fly in carried by their own garage built aircraft, many designed by someone named Burt Rutan. I never understood how Branson can be that naive warmist posterboy while he’s working with Rutan, who completely destroyed Global Warming theory in his slides and lectures. Probably Rutan just laughed at him long enough until he understood he’s on the wrong side of a trade. Thanks to the above comments ……. I fully agree, how can he be involved alongside Burt Rutan and not be influenced. Mr Rutan has many talks out there which make his thinking very plane ( pun !!! ) …… they must have sat down and talked about this stuff at some point ……. If Branson did not absorb something during his time with Burt, then I have no hope for the man ??? Naomi Klein is an anti-capitalist except when it serves her. “The Economist, in 2002, accused her of writing “page after page of engaging blather, totally devoid of substance”, with “all the incoherence and self-righteous disgust of an alienated adolescent”, whilst giving capitalism “no credit for the extraordinary progress seen in recent decades in reducing poverty and other measures of deprivation – notably child mortality – in the world’s poorest countries”. “Her new book, This Changes Everything she lists specific points that need addressing – the reversal of privatization, more taxation, stricter regulation of business, higher government spending – and prioritizes wealth distribution to win “the war our economic model is waging against life on earth”. Reneging on a promise ? Two of the most hypocritical egos on earth come into such close proximity and still no all consuming sucking singularity forms in the space between them? Is that weird or what? In the UK, Dulux has heard that green billionaires like to “p1ss money up against the wall”, so they’ve introduced an exclusive new color: it costs £1,000,000 a tin and it’s called “Pee Green”. Branson may have billions in assets but are they totally unencumbered? If he has lost $300 million then that could prove problematic, it’s just enough to trip up any company that may be overextended here or there. I can’t make up who I despise more. Branson or the Greens. Either way I am laughing. Governments have no money, they spend our money sometimes very badly on schemes that have no base in reality, like CAGW. I think Anthony understood that. I liked his slam on government waste. If governments have so much of your money to afford mad cap schemes then you are being overtaxed. Richar Branson is not stupid. Virgin Records, Coke, Atlantic and Galactic. If he’s not putting his money into the green machine then it’s clear he sees he cannot make money out of the “industry”. The gig is certainly up for the CAGW crowd. Is it “not stupid” to tell his workforce that those who are sceptical should find jobs elsewhere? I bet the day after the number of fault reports sky-rocketed and the clear up rate plummeted as all his engineers updated their CV. Remember he is on the “EMPLOYER” side of the employer/employee equasion. Branson in a pickle ???? For the benefit of you and others who may not know, saveenergy was making a joke (and revealing he is British). A British sandwich delicacy is Branston Pickle. Partial puns with more than one meaning are very British humour as displayed, for example, in Carry On films. Surely he could only claim back what he ‘PAIDED’ in taxes from a business. If the business went bust before making a return, then no tax, therefore all the money is LOST. Yes, the money is lost. Therefore he can (and should be able to) deduct those losses, as applicable. If you had to pay tax on investment money that yields no return (that is, in fact, lost entirely), there would be a lot less investment. I don’t understand why Naomi Klein is a star. I’ve read some of her writing, it lacks depth and shows her inexperience. She writes like a high school kid. Why do so many people insist on referencing and quoting this person? Because they think (and I use the term loosely) like high school kids? I’m sad to say I once liked RIchard Branson. However, whether I have grown older or wiser or he has grown older and more pathetic, he now looks like some pensioner trying to be “in” with the kids a fraction of his age. The final straw was when he more or less said he didn’t want anyone working for him who had looked at the scientific evidence and agreed it hadn’t warmed in the last 17 years. Which, as most engineers are sceptical at least to a degree, is more or less saying “my engineers can go f** themselves”. I saw an interview of Branson on TV yesterday, not sure when it was taken. He said that all of the profits of his airline are being spent to develop an alternative to jet fuel and he expected to switch over his fleet within 5 years. For someone so obviously capable as a businessman, it’s an incredibly stupid commitment to make. I’ve lost a fortune in the last week. I asked me how much for a green thing and I told me a green thing would cost me a fortune. So I paid me a fortune. Luckily, the expense is tax-deductible – because the thing I bought from me is green. I’m so happy to do have done business with me. Naomi Klein, cannot answer any questions right now has they are busy on a around the world book flogging tour , to tell people how they are evil if they fly. Expect if you of the left and the have books to flog that is. But its to her credit that rather than go to live a ‘socialists paradise ‘, such has Cube, she has the courage to remain in the land of the ‘evil capitalists’ . Living the type of privileged life not only those that get to experience first-hand a ‘socialists paradise ‘would kill for and but plenty of others actual living in the same ‘evil capitalists’ land can only dream about. Even Branson knows its a scam. Gives the greens just enough money so he can go to the parties and be socially acceptable. Yep, Branson is a koch. He is to Green business what ‘dad-dancing’ is to disco. Branson doesn’t say he lost money, only that he didn’t double his money. However, there certainly is an implication he doesn’t see a future in increased investment. The downside of corporate taxes for the public is that when companies make money, the public makes money through increased tax revenues. However, when companies lose money, they are able to use this loss to avoid paying taxes on money they did make. As a taxpayer, we should be very concerned when misguided activists such as Naomi Klein suggest that increased taxes and income redistribution will solve the worlds problems. The only solution that has actually been shown to work over the centuries is the economic model where people are allowed by governments to keep the fruits of their labors. Most of the worlds problems can be traced directly to the other economic model, where the powerful of the earth take the fruits of the labors of the rest of us, typically under force of law set by the same powerful. The peasant tax revolt in England came about because the government of the day decided it would take 1 in 7 of everything the peasants produced. Most of us today would be very happy with an income tax rate of 1 in 7. Instead our tax rates are much, much higher. There is plenty to go around on this earth, if people were allowed to keep what they earn, to spend as they see fit. Without the powerful trying to dictate how the money we earn would be better spent, if only they were allowed to spend it. Thus, they should have the right to take from the poor, to give to the rich. That 1 in 7 was probably not on profits or surplus; but on the entire harvest – of which the peasant had to put back half or so as seed for the next season. So it was likely existentially threatening; and in reality more like 1 in 3 of the surplus. At least that is approximately what the system was in Germany ca. 1000 years ago. Where the Naomi Klein’s of the world go wrong is in the assumption that governments are somehow able to take money from the rich and redistribute this to help the poor. Nothing could be further from the truth. Governments are powerless to take money from the rich. The rich use their money to protect themselves from governments. Entire industries exist solely for the purpose of helping rich people avoid taxes. Entire countries exist just for this purpose. Governments that do try and take this money find that it quickly leaves the country for safe havens, and the local economy collapses, often bringing down the government in it wake. It is the poor that pay the taxes that support governments, because it is the poor that lack the resources to avoid taxes. Redistribution schemes at best take money from the poor to give to the poor, allowing the rich to skim the cream off the top. Thus, when the rich get into trouble, there are wall street and bank bailouts, all paid for by the poor. When the poor get into trouble, they truly are in trouble. No one comes to their aid, except the likewise poor. Government has a very hard time taking money from Sir Richard. That’s why he can’t spend longer than 90 days a year in Old Blighty. This blessed plot, this earth, this realm…this Necker Island. gee, who do the poor work for then ? I used to work for one of his premier companies. Absolutely shocking once you draw back the curtain. How he and his companies get away with the favourable press they get in the UK I just don’t understand. Its all rubbish. As for the Green stuff…trust me, they believe it & it comes from the top. Or at least RB makes his people repeat the mantra. As an insider I can tell you the money they waste on this is shocking…I guess mouthing platitudes to greens is what its about perhaps. This is the Emperor’s New Clothes played out with an emperor who was bright enough to detect the scam, but is too compromised to do much about it. In the picture I see Gore. He too has dumped green investments. Branson should realise that it’s all for the sake of the planet and the grandchildren. Surely balancing the books and saving the Earth should not be compared. He didn’t say he lost 300 million, only that he didn’t make as much in profit. It could be that he profited 100 million out of hi 300 million. Hard to tell. There are plenty of green businesses which have gone completely bust in the recent past, such as Solyndra. And Branson has form (at least he claims form) for reimbursing investors out of his own pocket when possible, when investments go bad – at least, that is what he claimed in his book “Losing my Virginity”. Eric, he may have reimbursed the “correct” people (joe average no name guy surely ate his own losses), but the act was entirely strategic to either protect himself from being an clique outcast or to use as leverage in promotion of his brand (or book). It was not an act of humility or kindness – neither trait exists in him. That would mean that he got back his 300 million investment plus 100 million. Or that he continues to leave the original 300 million in the business and gets a return of 100 million annually. If that were the case, he’d stay in. And, oh yes, is the 100 million pre or after tax? Was the investment his or shareholders’ money? One can communicate business issues very clearly – but only by using precise language consistent with ‘generally accepted accounting principles.’ Perhaps the most misunderstood concept in these blogs is ‘write offs’ followed by confusing revenue with profit. Sounds like extortion. or bulling. Give me your lunch money or I will talk trash about you. I will simply note the “We” could mean anyone. “We” does not mean “I”. Notwithstanding that equivocation, his statement is still useful as an accurate comment on the results of investing in “green” technologies. As a recovering consultant, I can attest that word-smithing is an art form with these folks. The definition of green technology is anything that causes even a slight reduction in “harmful” acts or products. For example, using an new app that incidentally and indirectly helps them layoff people is an example of using green technology to reduce company related carbon usage (e.g., commuting). It’s not a war, it’s an expanded terrorism prevention operation outsourced to the military who already happened to be in or near the the required country of interest. Let’s hear how much the Guardian has spent (wasted) on green efforts. No fulfilling his pledges? Does that mean he won’t get his “Simon and Garfunkel: The Concert in Central Park” CD and Greenpeace umbrella? In my experience, Naomi has a habit about being wrong about everything all the time. I’ll wait for a second opinion about Branson myself. Who would invest money with Bram’ now? Come on Richard, next you will be telling us that your space scuttles cannot get off the ground! But I am sure that many “university” funds will keep your stuff going! Sound like he figured out after spending $600M that it wouldn’t work. Of course the Greens don’t want to hear that, but the reality is not their forte. If you make a promise, and you have fistfulls of cash, you better pay up. Ridiculous that he could make any claim that would make anyone not think of him as a short-sighted, selfish, money-grubbing jerk. No take-backsies. With $300M spent. Branson’s “Climate Guilt” has been assuaged. 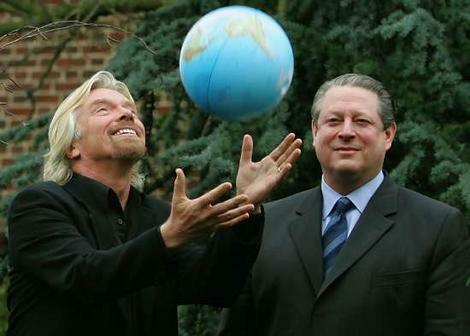 Branson visibly delights in bouncing that globe prop. Does it remind anyone else of Charlie Chaplin’s globe scene in The Great Dictator? Yes, immediately. Only instead of Charlie Chaplin, Baby Boomers. And as is their wont, they are busy ripping out and selling the plumbing, electricity, agriculture and transportation the free society their parents gave them, and undoing all of their parents’ work and victories. Not to mention the brainwashing they have given the generations following them in place of an education. read Tom Bower’s “Branson: Behind the Mask”. his hypocrisy is well matched with that of other faux CAGW icons. what is hard to believe is that it has taken so long for his CAGW-activist admirers to work it out. Richard Branson actually expects his green investments to make a profit? How very capitalist of him. News FLash: A pledge is just a pledge. Until he actually gives them the money (and pays taxes on the transaction), it is still HIS money. True, it is still de facto his money, but a pledge is still a promise to anyone with scruples. Websters: a serious promise or agreement. People make commitments based on a pledge. When someone breaks a pledge, they aren’t just changing their mind. They are, in fact, breaking a solemn promise. And, if they never had the intention of fulfilling that pledge, they are lying and potentially breaking the law, if the situation warrants some kind of judicial satisfaction (there is a possibility that the money was no longer his when he made the pledge but suing for it would be bad for business). Pledging is the foundation of business, philanthropic and social contracts. But, perhaps, I should use the past tense since it appears that fewer and fewer people adhere to any sense of honor. I have had the “pleasure” of spending off work time with Branson. He is and always will be a publicity seeker for the lowest cost. He is also rather dim but he knows two things: how to get others to do his bidding for his amusement and how to ensure he enriches himself always. Unfortunately, in this age of media, no one will actually challenge his lordship with even a moderately developed set of questions b/c we will quickly ascertain that he is an idiot, a successful idiot, but an idiot nonetheless. PS, some time ago when his vacation home was ablaze, he was lauded b/c he was so heroic in making sure his family and guests were safe. The most important part of the story that branson wanted to make sure got into the news was that he was naked or near naked for most of the effort. That is classic branson – in fact, it would not surprise me if he took the time to undress. Apparently when RB was on one of his balloon trips he panicked and released full canisters of gas and only the quick thinking of the actual balloon captain saved them from disaster. I sincerely hope RB doesn’t pull a stunt like that in his Virgin Galactic spaceship!!!!! Branson was correct when he made ​​that kind of money to support a completely illogical idea and claim that over CO2 can solve the problem of climate change. If this reads Branson, I think I can help you with that kind of money solve millennium enigma as to who is the main cause of climate change. If interested and be smart like in this case, I suggest that we can save humanity from the causes and consequences of these changes, as well as all those who unscientific way they want to make stupid and Science and the normal people, so that they were rich on false evidence. Branson, if you feel the same in this my truth, you have a way with me now make contact and make a deal. The more you get to this, but we would have lost, listening to illogical ideas. And just what kind of behavior did anyone expect from these two? Honorable? Really? ROFFLMFAO!